Hubby and I were with friends checking out a new restaurant and unsure of what to order. We saw a delicious chicken dish pass us by. Then the same dish again…and again. As I looked around the small dining room of the restaurant, The Wine Shop, I realized that at least one of those very chicken dishes was on every single table. It was obviously the regulars’ choice. So, we chose it, too. And after enjoying a delicious arugula salad with beets starter salad, that very chicken dish finally made its way to our table. After one bite, I realized why the dish was so popular. It was spectacular! That crispy chicken was a real palate pleaser. But a surprise came on the same plate, and it was the side of warm farro salad. Being a fan of unique grains, I figured I’d like it, but I really, really loved this use of farro. The farro was tender and the flavor was rich with what tasted almost like a mushroom broth. I immediately started taking note of the features and flavors of the dish with the idea of recreating the dish (both parts of it – chicken and farro) when I had the chance. 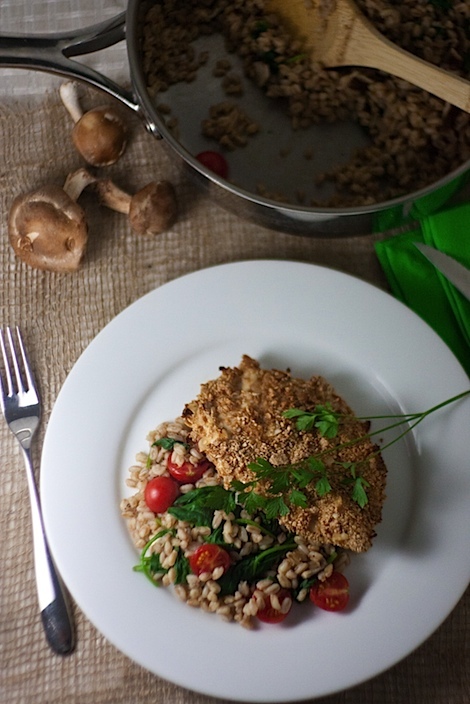 The chance struck mid-last-week when I decided to see if I could re-create our amazing chicken and farro dinner. 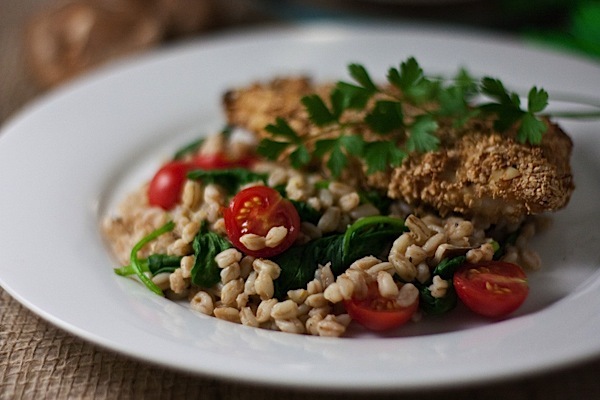 Yet, while I wanted to do some take on crispy chicken, the dish I really wanted to recreate as close as possible to the original form was the warm farro salad. I started with some farro that I picked up from the bulk bin section of my local health food store. I cooked it in broth, added in shiitake mushrooms, and then at the last minute, I stirred in fresh baby spinach and cherry tomatoes from my garden. The result, paired with crispy, oven-fried chicken, was all I wanted and more. I’ll share the chicken recipe in a separate blog post. For now…I give you a super easy way to enjoy farro. That’s right. 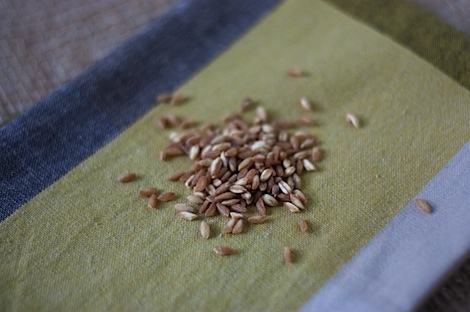 I’m guessing most of you are unfamiliar with exactly how to prepare farro, but this is a great recipe to introduce you to the ancient grain. Wondering, “What’s the best way to cook farro?” or even “what the heck do I do with farro?”. Here’s an extra-easy recipe that will pair well with almost any protein. I like mine served with Oven-Fried Crispy Almond Chicken, but steak, a vegetarian or vegan protein, or even another chicken recipe should work just fine. Bring 2 cups broth to a boil in a large pan (with tall sides). Add salt, and farro and stir. Partially cover pan, reduce to simmer, and cook farro till almost tender, about 25-30 minutes, stirring occasionally. Stir in the mushrooms after the first 15 minutes. Add additional broth, if needed. Note: I added about 1/2 cup of broth after the first 30 minutes. Add spinach to pan, stir in and cook until wilted, about 5 minutes. Add cherry tomatoes. Season with salt and pepper, as needed. Stir to combine. Cook until cherry tomatoes are warmed through, about 1-2 minutes. Serve with something delicious like Oven-Fried Chicken, and enjoy! Click here to get free The Chic Life updates (via email or RSS feed). Be the first to know when I post a new recipe or life story. Reader Question: Have you ever tried farro before? If not, what’s your favorite grain? If yes, how was it cooked/served and did you like it? I love farro! Have a hard time finding it but do love it. I substitute barley often times for farro when I can’t find it. delicious looking recipe! i’ve never tried farro but now i’d love to! personally, my favorite grain is israeli couscous..delish! I just bought some of that from the bulk bins at Earthfare! Anywho, you should totally tried farro. Yummm! Looking forward to trying this! I love farro – have made it with butternut squash, shallots, and fontina cheese, which is also good. When do you add the shiitakes, and how much? I’m not seeing them up there. You should totally try it! It’s easy and tasty! that whole meal looks amazing!!! 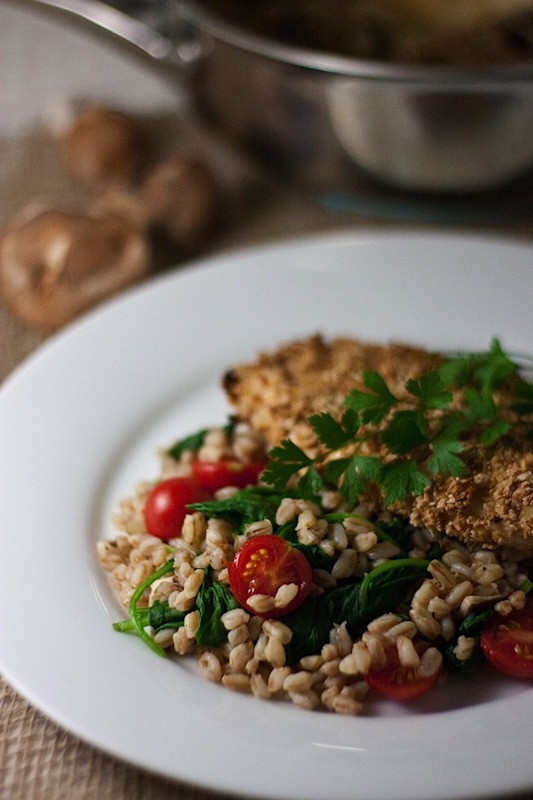 ive never tried farro but would love to one of these days..maybe this was the recipe i needed! 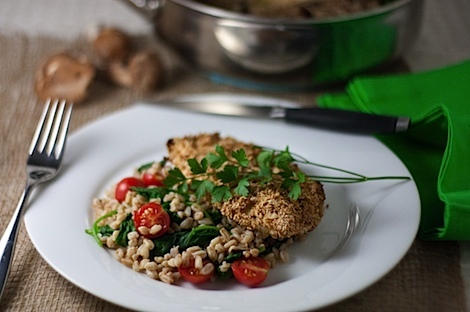 Have just started to cook farro and discovered this recipe and your site. I made it last night, my husband and I loved it.